Star Trek: Benedict Cumberbatch vs Ricardo Montalban - Who Was The Better Khan? - WhatCulture! Modern Human Evolution: Are Superhumans the Next Iteration? - Now. Powered by Northrop Grumman. Star Trek Into Darkness: exploring the plot three years on - Den of Geek! Khan Noonien Singh, commonly shortened to Khan, is a fictional character in the Star Trek science fiction franchise. The character first appeared in the Star Trek: The Original Series episode "Space Seed" , and was portrayed by Ricardo Montalbán who reprised his role in the 1982 film Star Trek II: The Wrath of Khan. In the 2013 film Star Trek Into Darkness, he is played by Benedict Cumberbatch. Khan Noonien Singh, commonly shortened to Khan, is a fictional character in the Star Trek science fiction franchise. 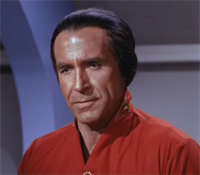 The character first appeared in the Star Trek: The Original Series episode "Space Seed" (1967), and was portrayed by Ricardo Montalbán who reprised his role in the 1982 film Star Trek II: The Wrath of Khan. In the 2013 film Star Trek Into Darkness, he is played by Benedict Cumberbatch. In Star Trek Into Darkness, set in the alternate continuity established in Star Trek (2009), Khan is awakened almost a decade before the events of "Space Seed". Khan is given the false identity "John Harrison" and coerced by Admiral Marcus into building weapons for Starfleet in exchange for the lives of Khan's crew. He ultimately rebels and comes into conflict with the crew of Enterprise.